IF THINGS HAD GONE to plan, the iconic logo – blue letters on a background of Brigitte Bardot pink and plain white gingham tiles – would not have said ‘TATI’ at all. In 1948, when Jules Ouaki opened a small textile shop in Boulevard de Rochechouart in the 18th arrondissement of Paris he wanted to call it ‘TITA’ after the nickname of his mother, Esther, but that name had already been registered by someone else and so by rearranging the letters, ‘TITA’ became ‘TATI’. Jules Ouaki was born in Tunis in 1920, the eldest of nine children. He arrived in Paris at the end of the Second World War penniless but not without ambition. He found work in the ‘rag trade’ selling lingerie but, like others before him, Jules Ouaki was not content to be a small time salesman. 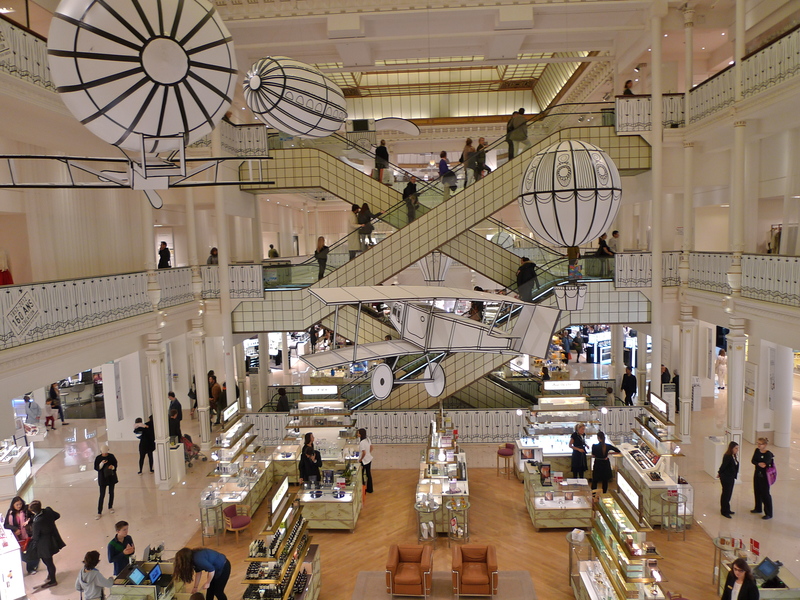 In the second-half of the nineteenth-century, the new and phenomenally successful Parisian department stores revolutionised the concept of retailing. All of them had grown from very humble beginnings to become successful retail giants thanks to great entrepreneurs like Aristide Boucicaut at Le Bon Marché, Ernest Cognacq at La Samaritaine, Jules Jaluzot and Jean-Alfred Duclos at Printemps and Albert Kahn at the Galeries Lafayette. Jules Ouaki was an entrepreneur and he too would seek to grow a giant retail business. In 1948, Jules Ouaki opened a 50 M2 shop on the Boulevard de Rochechouart in the Barbès district of Paris selling mainly textiles and clothing. This first TATI self-service store emulated the by then well-established retailing principle of ‘pile it high and sell it cheap’ but Ouaki also needed to differentiate his business in what was becoming an overcrowded market. To do that he decided to position TATI not only to sell its goods at low prices – but at the lowest prices. 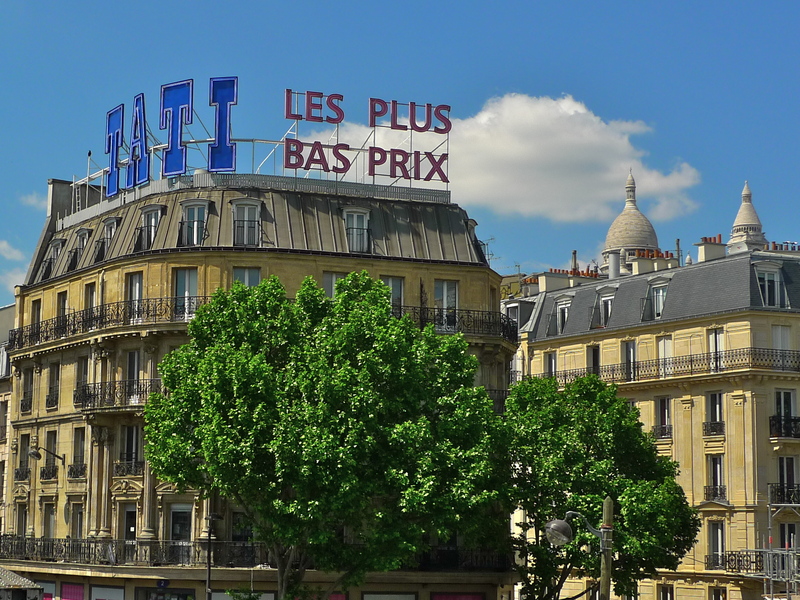 And thus was born the advertising slogan still proclaimed today from on top of the site of the original store – ‘TATI – Les Plus Bas Prix’. This slogan, ‘TATI – The Lowest Prices’, attracted customers and served Jules Ouaki well. He was able to expand his enterprise turning the original 50 M2 shop into the sprawling 2,800 M2 retail space we see in the Boulevard Rochechouart today. 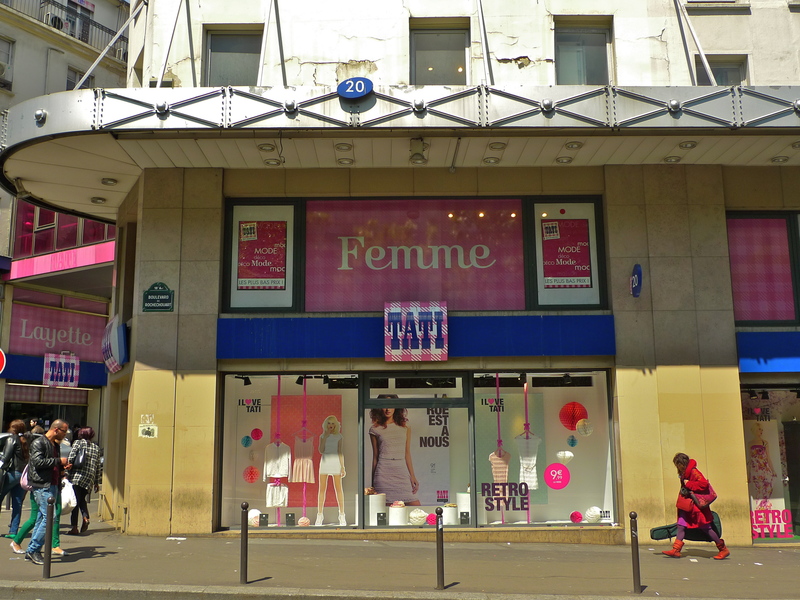 In the 1970’s TATI expanded even further opening new stores in Paris in Place de la République and Rue de Rennes as well as beginning an expansion into the provinces with stores opening in Nancy, Lille, Rouen, Marseille and Lyon. So the TATI success seemed assured – but there was a sting in the tail for this family business founded on the mantra of ‘TATI – Les Plus Bas Prix’. In 1982, Jules Ouaki died leaving his wife, Eleanor, and five children but no clear plan of succession for the running of the business. Who was now to take up the reins and lead the business? It was left to Eleanor to choose a successor. Her choice was Fabien, the youngest of the five children and he, after much vacillation, agreed ‘but only to please his mother’ he later said. Under its new leadership TATI continued to expand through the 1980’s and 1990’s adding more brands, an increased product offering and a wider geographical presence. As well as selling textiles and clothing, TATI now offered household products, cosmetics, wedding dresses, sweets, jewellery, spectacles and even a travel agency. It also began to expand outside France. Stores were opened in Europe, South Africa and the United States, including one store on Fifth Avenue in New York. Fabien Ouaki became the largest shareholder in TATI in 1995 and by then he was heading a successful enterprise that had 29 stores and well over 1,000 employees. In the early days, Jules Ouaki had differentiated TATI not only by selling at low prices – but at the lowest prices, a formula that worked well and led to great success. But commercial differentiation only works if it does what it says and actually differentiates an enterprise from its competitors. Once competitors muscle in and copy a successful commercial model the enterprise faces serious trouble unless it acts quickly and decisively. At the turn of the millennium TATI faced exactly this problem. Competitors like H & M , Babu and Zara were striking at the very heart of the TATI business, the discount textile market. TATI was over-diversified and overstretched and couldn’t respond. The company eventually ran out of cash and on 28th August 2003, TATI filed a petition for bankruptcy with the Tribunal de Commerce de Paris. The court gave Fabien Ouaki some breathing space to try to right the ship but to no avail. At the end of 2004, the Ouaki family decided that after fifty-six years of trading they were going to pull out and let the business go. 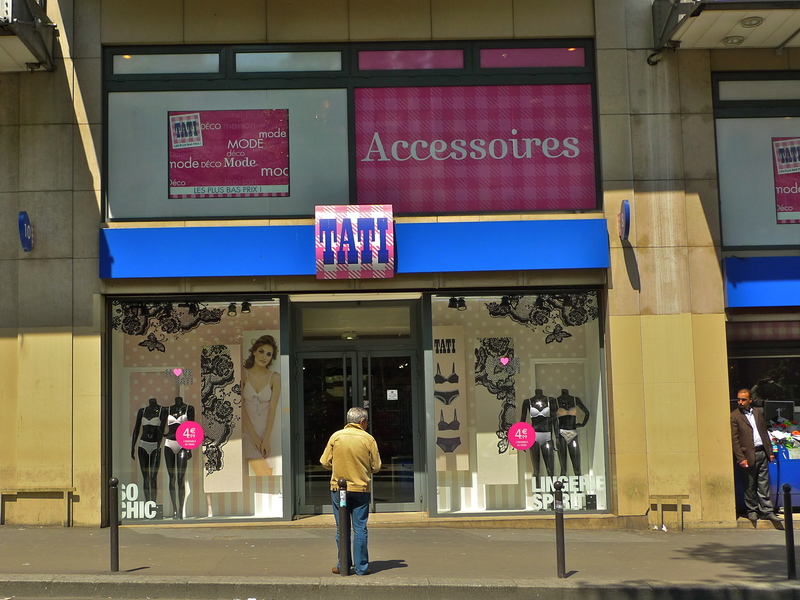 Soon after, TATI was bought by a subsidiary of Groupe Eram for €10 million payable in cash plus €4.5 million for the store inventories. Since then, the new owners seem to have been able to breathe new life into the enterprise. Today, TATI has 129 outlets in France and is making a rapid expansion into Eastern Europe. 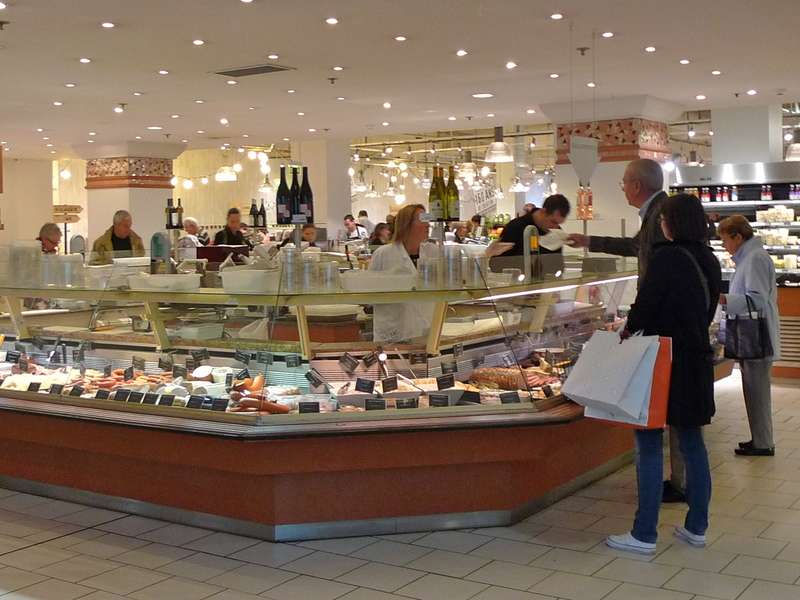 Its central focus is on the 25% of households earning less than €20,000 per year across Europe whilst attracting a significantly higher proportion of French consumers. To that end it has to some extent moved away from the former ‘bazaar’ type presentation of its products to a more formal in-store presentation and it now has a presence on the internet. 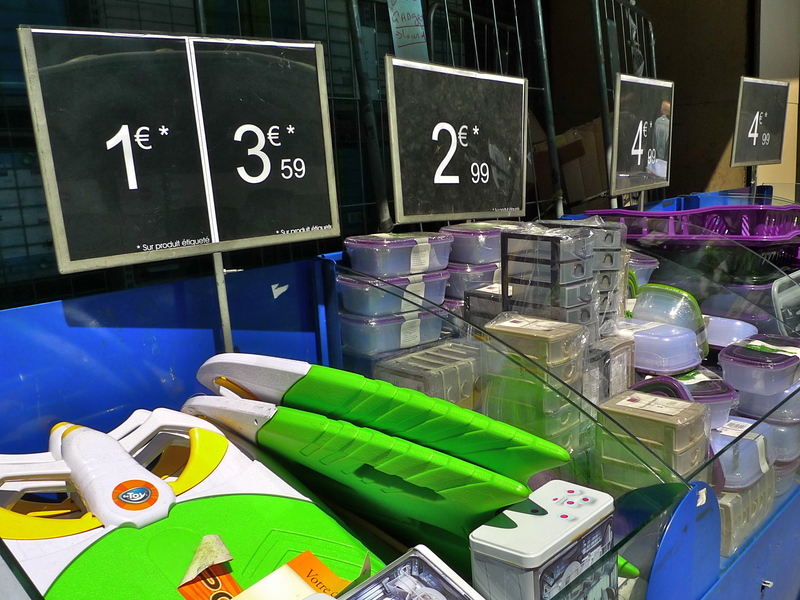 Yet, despite this slightly more up-market approach, the average selling price of items in a TATI store is €5. 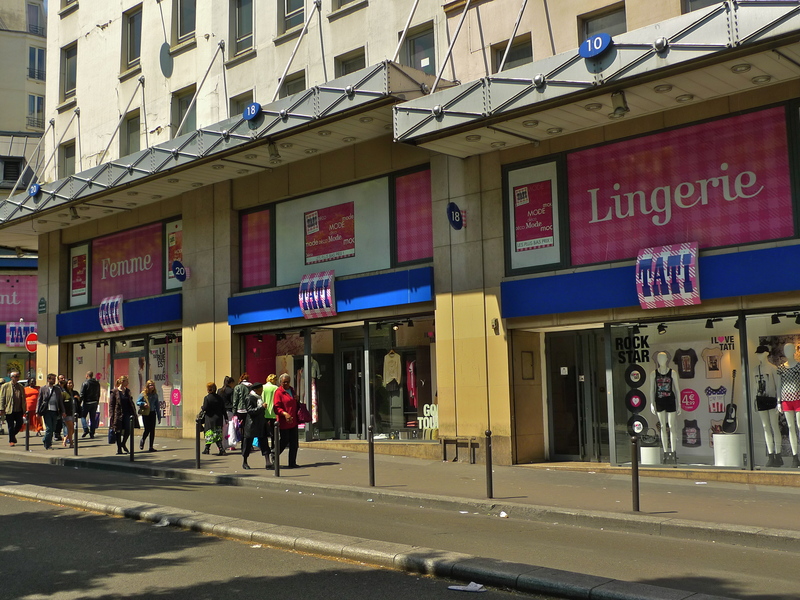 I went to explore TATI in the Boulevard de Rochechouart the other day and walking round listening to the soundscape inside the store I couldn’t help pondering its history, its near death experience and its subsequent revival. Jules Ouaki founded TATI in 1948 as a lowest price retailer. Whatever his motives, the effect of what he did was to democratise shopping – to make at least some of the essentials of life, clothing in particular, accessible to the poorest in society. We will never know whether Jules Ouaki, the entrepreneur, could have weathered the storm of competition that descended upon TATI at the turn of the century or whether he would have been ahead of the game and foreseen the challenge and responded to it before it happened. It seems to me that the old TATI suffered from a condition common to many failing businesses – a myopic view of the world unadorned with any semblance of reality coupled with ambitions exceeding the depth of its pocket. Groupe Eram appear to have secured TATI’s future for the time being but they have done one thing that seems to me at least to be completely inexplicable. They have allegedly done away with the iconic TATI logo. The Brigitte Bardot pink and plain white gingham tiles have completely gone and the blue letters have been replaced with letters in, can you believe it, raspberry! Groupe Eram may be anxious to shed the image of the former failed TATI but I’m sure the original logo will live on in the minds of many Parisians as one of those things you just don’t mess with. 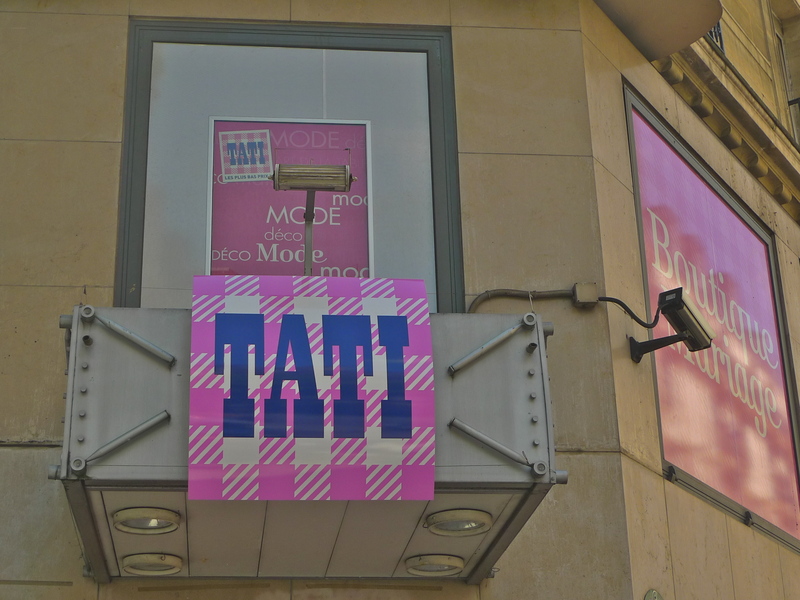 Anyway, although introduced in February 2013, I for one am delighted to see that news of the new logo has yet to reach the TATI store in the Boulevard de Rochechouart! 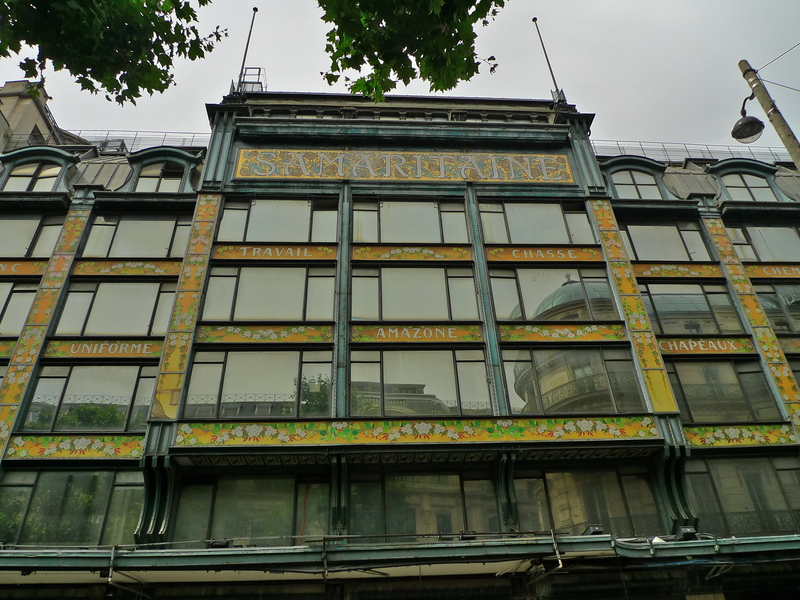 ON 15th JUNE 2005, La Samaritaine, one of the Parisian Grands Magasins closed its doors for the last time. For the last eight years it has stood empty looking increasingly down at heel and rather sad. Even though work to redevelop the building has just begun the Parisian icon that was La Samaritaine is set to disappear forever. In 1856, an aspiring young entrepeneur, Ernest Cognacq, opened a small shop called Au petit Bénéfice in the rue de Turbigo in Paris. The venture was a failure and the shop soon closed. Undaunted, Cognacq took to the streets as a hawker selling fabrics of various kinds. 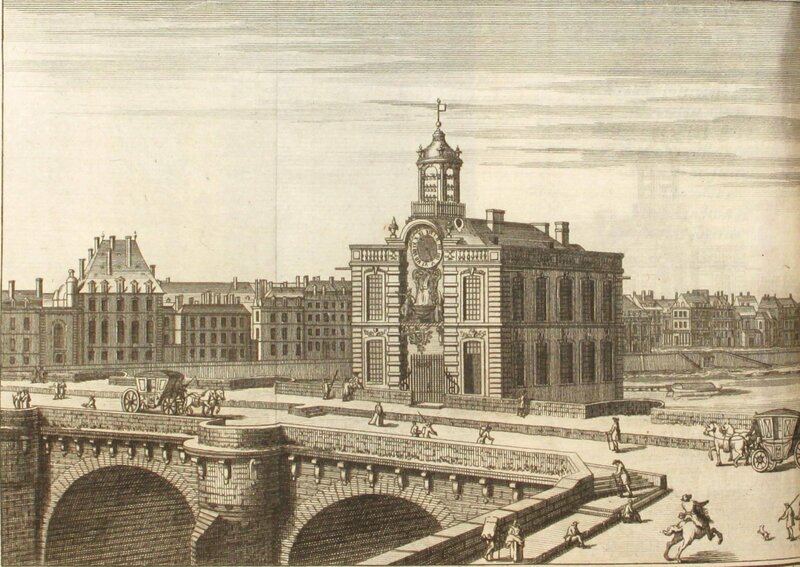 He eventually set up a pitch on the Pont Neuf, on the site of the former Pompe de la Samaritaine, a large hydraulic water pump named after the Samaritan women at the well in St John’s Gospel. Pompe de la Samaritaine – The original pump was built in the early 1600’s. This revised version was built between 1712 and 1719. It was demolished in 1813. 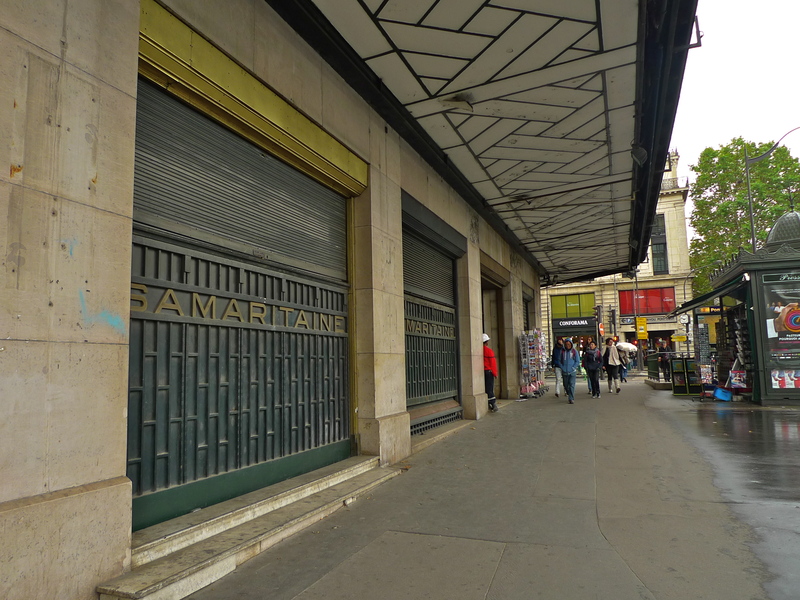 Cognacq’s enterprise prospered and by 1869 he was able to rent a small room across the street from the Pont Neuf in the rue de la Monnaie, which he turned into a shop and called La Samaritaine. Cognacq’s success was assured when, in 1872, he married Marie-Louise Jaÿ. 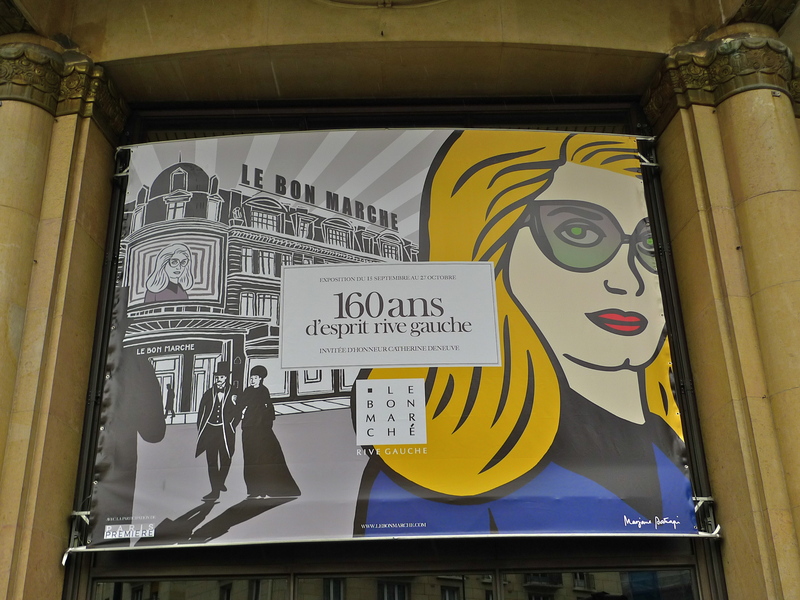 Not only was she a very active and intelligent woman, she had been the première vendeuse au rayon confection, head sales woman of the clothing department in Aristide Boucicaut’s Au Bon Marché – she came with a tidy sum of twenty thousand Francs. 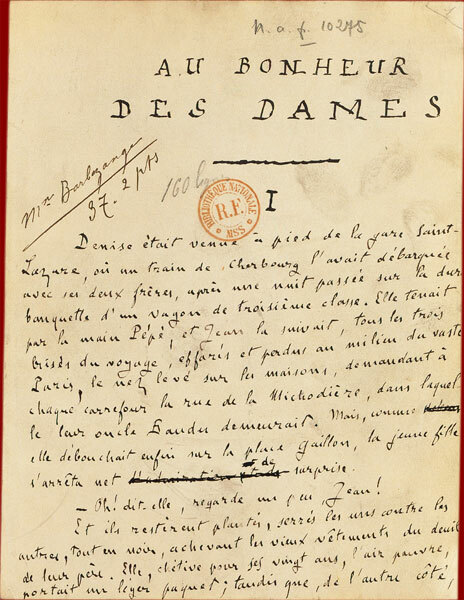 Ernest Cognacq and Marie-Louise Jaÿ proved to be a formidable team. 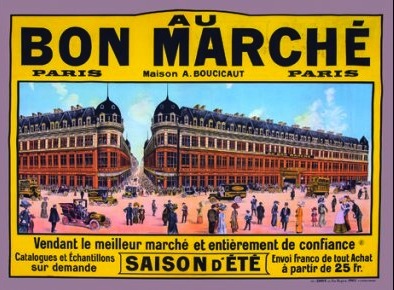 Inspired by the success of Aristide Boucicaut’s retail revolution at Au Bon Marché and with the help of Marie-Louise’s twenty thousand Francs combined with Ernest’s more modest savings, they set about expanding the enterprise and building the foundations of what was to become the Grands Magasins de La Samaritaine. Cognacq’s plan was to establish the ideal, and ideally managed, department store. He arranged La Samaritaine as a collection of individually owned outlets, each managed by petits patrons who operated in concert yet autonomously, a model still found in today’s Grands Magasins. The growth of the business was rapid. 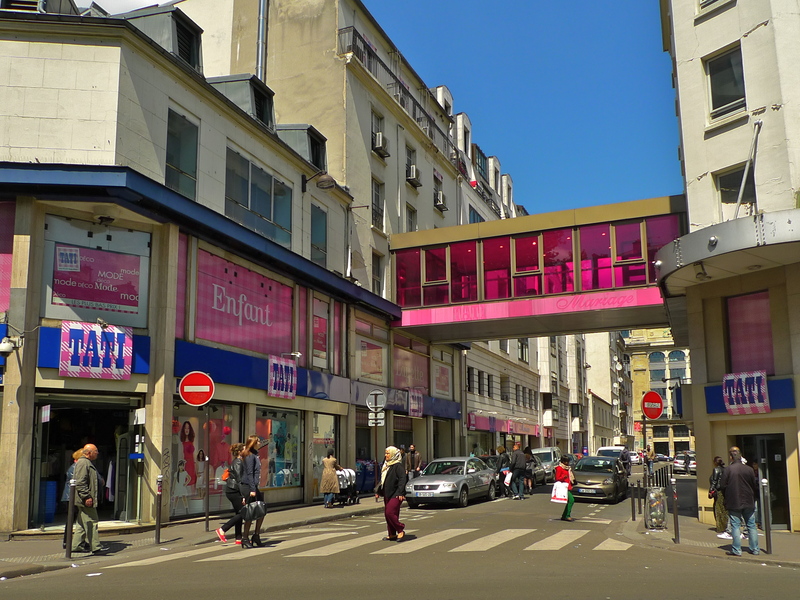 To increase the sales space Cognacq bought up neighbouring buildings – 19, rue de la Monnaie in 1886; 3, rue Baillet in 1889; 17, rue de la Monnaie in 1891; 20 rue de l’Arbre Sec in1893; the buildings located at the corner of rue Baillet and rue de l’Arbre Sec (5-7, rue Baillet, 22, rue de l’Arbre Sec) and at the corner of rue Baillet (1, rue Baillet, 21 rue de la Monnaie) in 1898 and the buildings between the impasse de Provence and rue des Prêtres-Saint-Germain-l’Auxerrois in 1903. All the buildings were made into four separate stores each specialising in different product ranges and rather unimaginatively but very practically named Magasin 1, 2, 3 and 4. The impact on sales of the additional floor space was astonishing. By 1875, sales had topped eight hundred thousand Francs, by 1882 they had reached six million, by 1898 fifty million and by 1925 sales were over one billion Francs. This dramatic expansion included major architectural changes that gave La Samaritaine its characteristic look. Between 1903 and 1907 the French architect, Frantz Jourdain, applied an Art Nouveau aesthetic to the buildings and by 1933 another French architect, Henri Sauvage, had reworked the architecture to reflect the aesthetic principles of Art Déco. 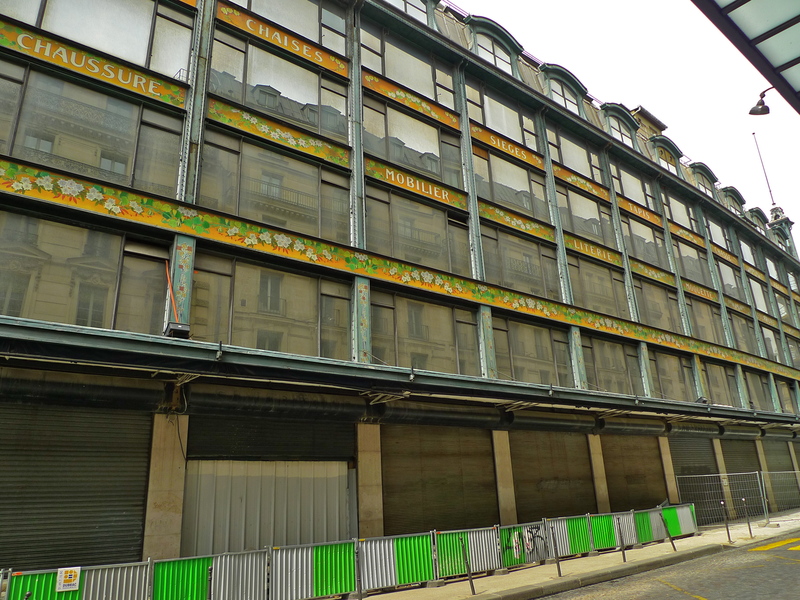 Towards the end of the 1970’s and into the 1980’s La Samaritaine began to lose its competitive edge and its prosperity began to decline. In 2001, the luxury goods group, LVMH, bought La Samaritaine and it soon became clear that the end was in sight. 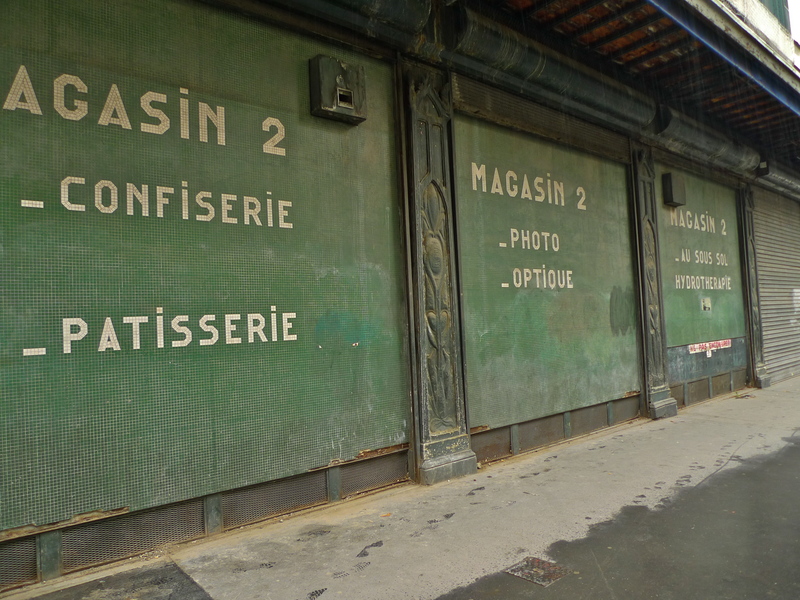 Magasin 1 and Magasin 3 were leased to other retailers and then in 2005, for safety reasons we were told, LVMH announced that La Samaritaine would be closed and the buildings redeveloped. And it was closed and it remains closed and it is likely to do so until some time in 2016. 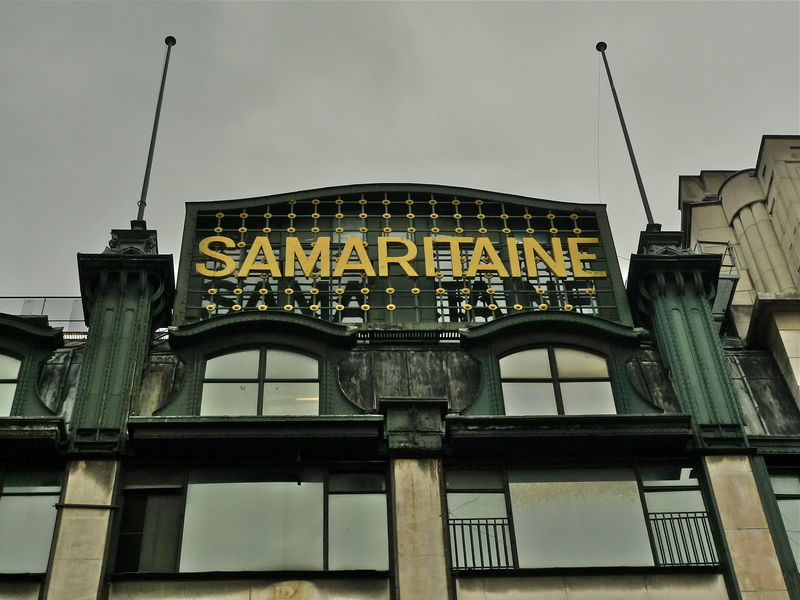 So what is to become of La Samaritaine? Well, it will become a mixed-use development designed by the Japanese architects SANAA. The plans include a luxury hotel, the Cheval Blanc, owned by LVMH, two midsize stores – DFS, a duty-free emporium and Louis Vuitton – both owned by LVMH as well as one department store, as of yet unidentified. In addition, there will be 20,000 square metres of office space, 7,000 square metres of social housing along the rue de l’Arbre Sec side of the building, a day care centre and a crèche to accommodate 60 children. It’s pretty clear that the new development is aimed at attracting big-spending tourists and especially Chinese tourists. To that end, I understand that it is planned make the entrance to the DFS duty-free store large enough to accommodate tour buses. 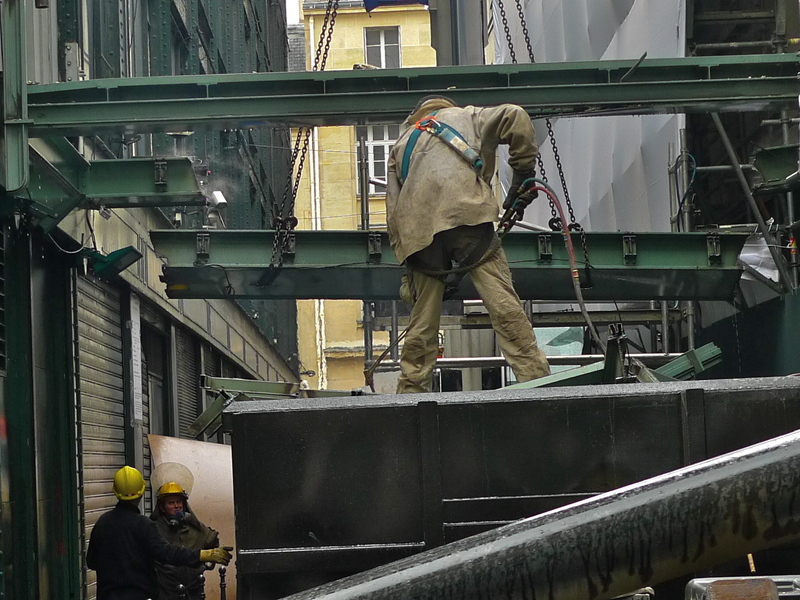 I went to have a look at La Samaritaine the other day and found a demolition crew at work removing the metal beams that formed part of the covered walkway between Magasin 2 and Magasin 4. 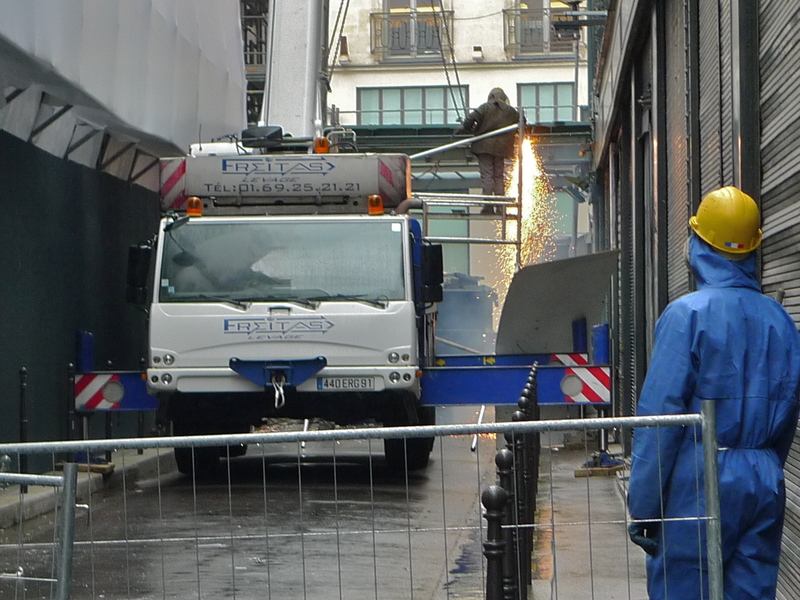 The site was dominated by the hissing sound of the oxy-acetylene cutting gear cutting through one the beams. Once cut, it was lowered and then cut again into smaller, more manageable pieces and loaded onto a truck. 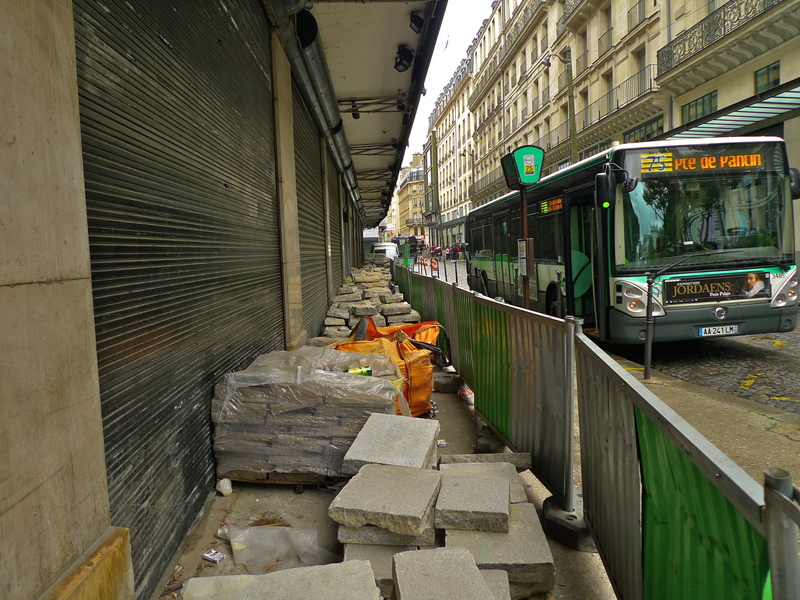 In the rue de la Monnaie, where once La Samaritaine stood proud and inviting, it was very much work in progress. I was able to circumvent a rather threatening security guard and peek inside the former Magasin 2 to find that it was a completely empty shell shrouded in dust. Some will argue that this renovation project is part of a bold and innovative vision for the future of the city – and they may be right. LVMH clearly think that the vast amount of money they are investing here will give them a competitive edge and reward them with pots of money – and they may be right too. But glitzy, fashionable, overpriced hotels, offices and department stores with entrances designed to accommodate Chinese tour buses do nothing for me at all. Call me old fashioned, but I mourn the loss of the La Samaritaine that I was so familiar with. But before I get completely carried away with my romantic vision of the past, perhaps it’s worth remembering that Ernest Cognacq and Marie-Louise Jaÿ also had a bold and innovative vision of the future – and they too made pots of money! EASTER SET ME THINKING about who invented the Easter egg. Whoever it was, their idea was a shrewd marketing ploy which has proved to be a resounding success. Novel ways of marketing chocolate are not new of course. Sulpice Debauve was doing it at the beginning of the nineteenth-century. 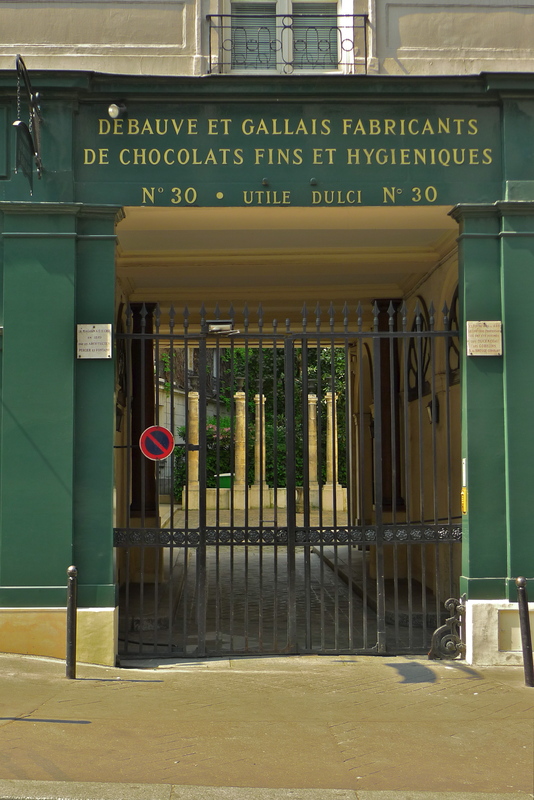 A former pharmacist to Louis XVI, Debauve opened the first chocolate shop in Paris in the Faubourg Saint-Germain-des-Près. He combined his talents as a pharmacist and chocolate maker with a flair for marketing what he called “healthy” chocolate. He marketed his chocolate, laced with exotic and novel ingredients, as being efficacious for people with weak constitutions, nervous stomachs and chronic ailments amongst other things. It was the start of a huge success. By 1818, Debauve had moved to 30 Rue-des-Saints-Pères. His shop, designed by Percier & Fontaine, architects to Napoleon I, still stands and is now an official historic monument. 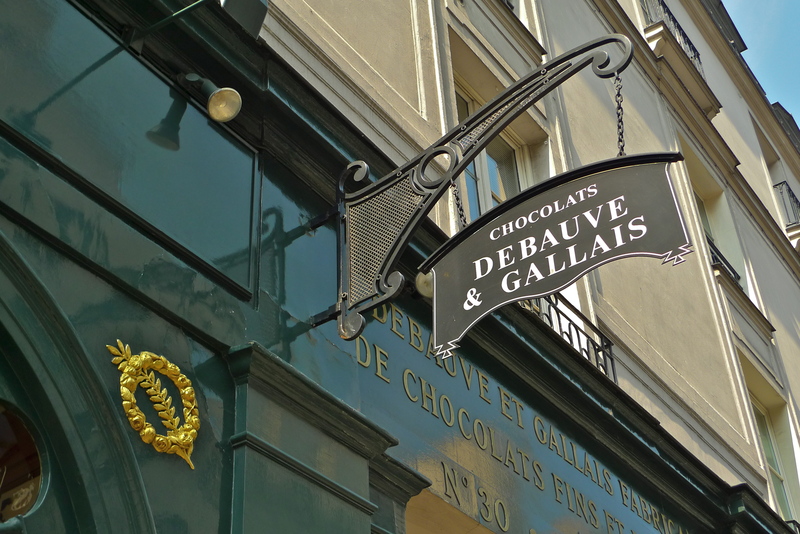 Today, the chocolates of Debauve & Gallais are sold around the world. 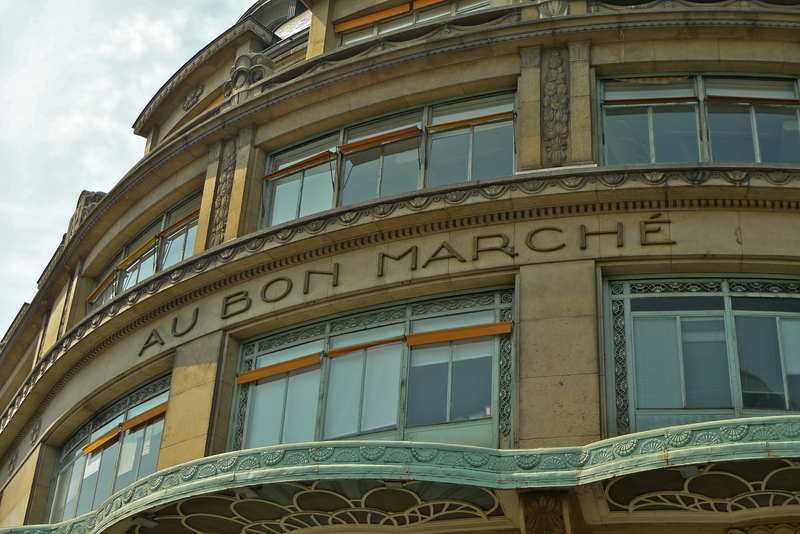 Someone else who knew a thing or two about marketing was Aristide Boucicaut, a former pedlar and founder of what was probably the world’s first department store – Au Bon Marché. Boucicaut’s idea was revolutionary. 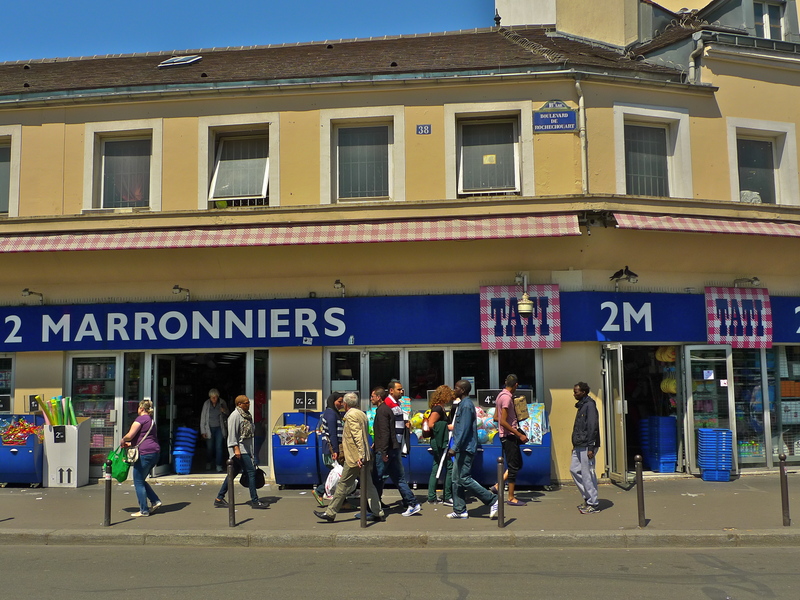 Under the Ancien Régime the typical retail outlet was the boutique specialising in one variety of product with no fixed pricing – bargaining was the rule. Boucicaut changed all that. I think we can safely say that Boucicaut’s idea caught on – and now it seems everybody is doing it. 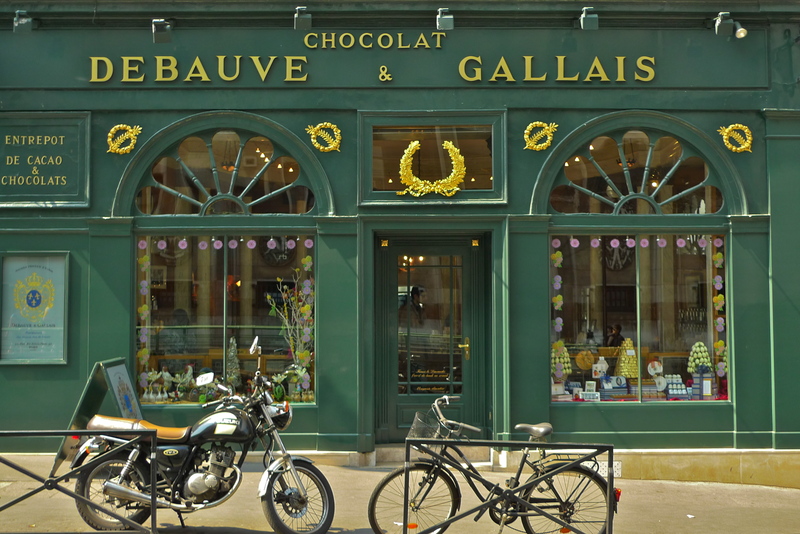 The chocolaterie Debauve & Gallais still sells “healthy” chocolate and it has retained its distinctive boutique look. 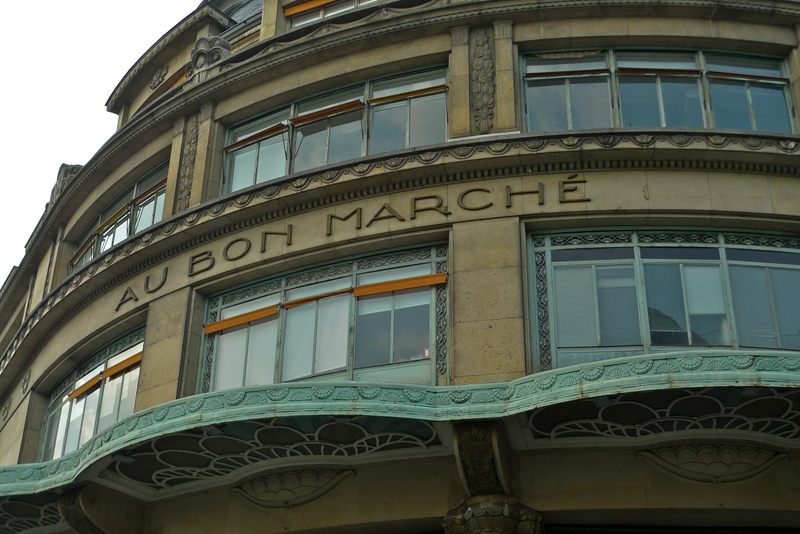 Au Bon Marché is still a department store and it has retained its Boileau architecture on the outside although little of it remains on the inside. Both are distinctive parts of the Parisian landscape. 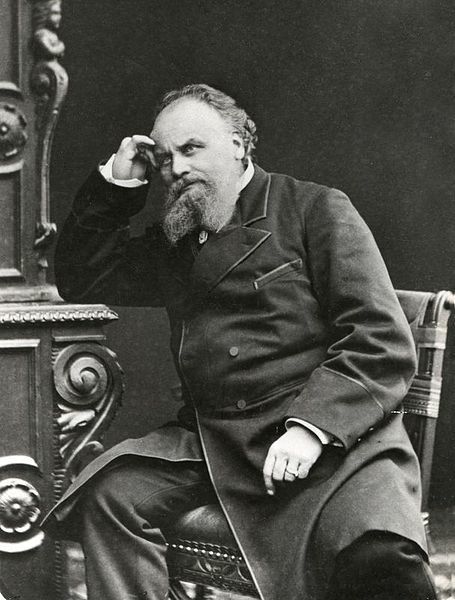 And … I still don’t know who invented the Easter egg – but I do know that it had to be someone with the determination to sell a vision – someone like Sulpice Debauve or Aristide Boucicaut. 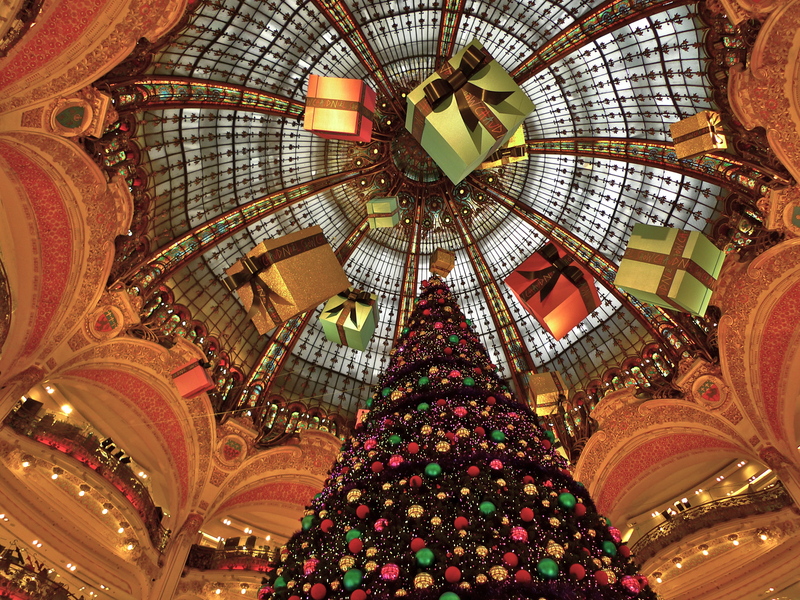 I AM NOT A FAN of shopping but even I have to admit that a trip to the Galeries Lafayette is an experience – especially at Christmas. Located in the Boulevard Haussmann in the 9th arrondissement, close to the Opéra Garnier, the Galaries Lafayette welcomes around 100,000 visitors a day – more than Harrod’s in London or Bloomingdales in New York. 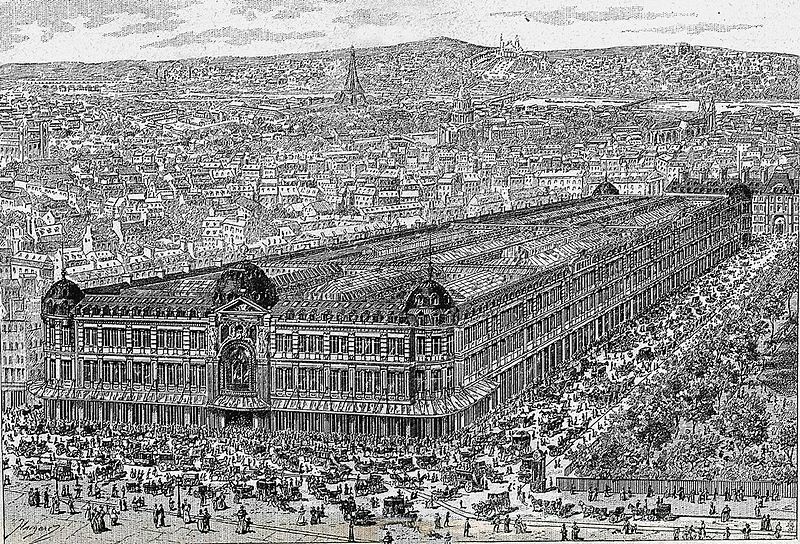 Compared to its status today as a 70,000M2 ‘Temple of Shopping’ and Paris icon, the Galeries Lafayette had humble beginnings. 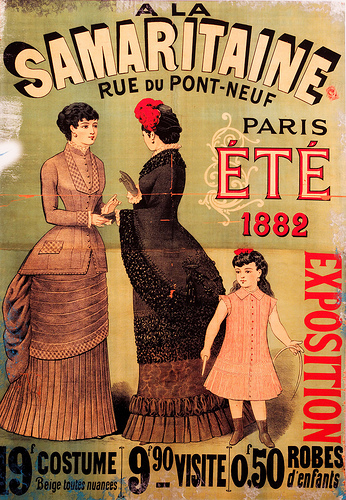 In 1895, Albert Kahn rented a shop in Paris at the corner of Chaussée-d’Antin and rue Lafayette to sell gloves, ribbons, veils, and other goods. The shop was small, but sales were good. It was eventually enlarged, and in 1898 Kahn was joined by his cousin, 34-year-old Théophile Bader. The partnership flourished and they soon purchased the entire building along with adjacent buildings on the Chaussée-d’Antin. 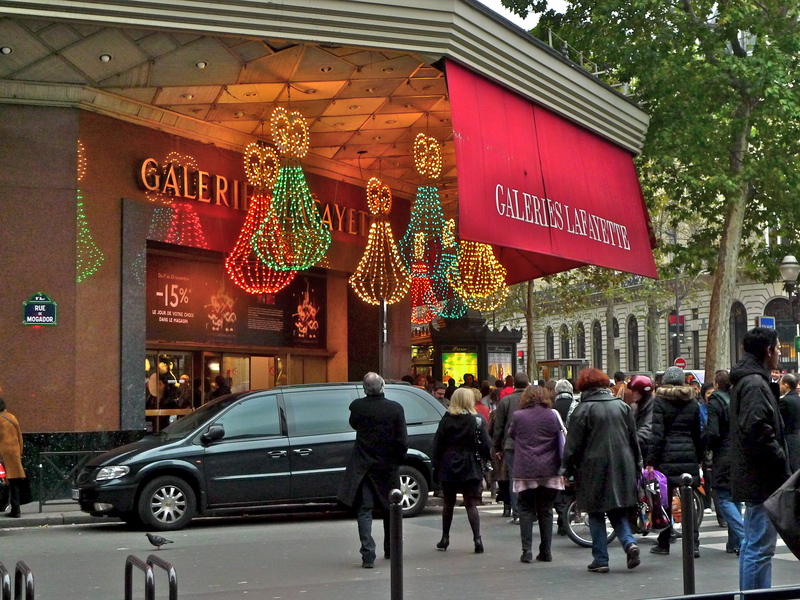 The Galeries Lafayette was born. 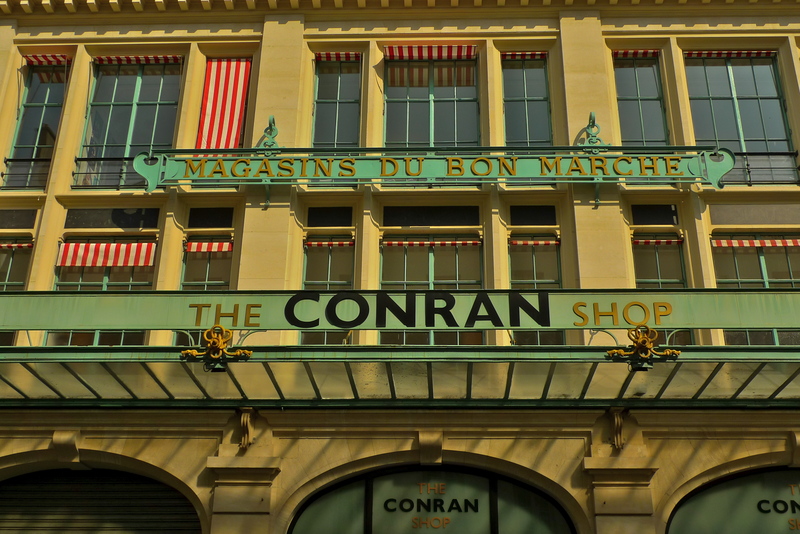 The magnificent glass dome and wrought iron balconies dominate one end of the store – a vivid reminder of 19th century Paris – contrasting starkly with the clean-cut, up-market, brand-named, cosmetics counters that lie beneath. 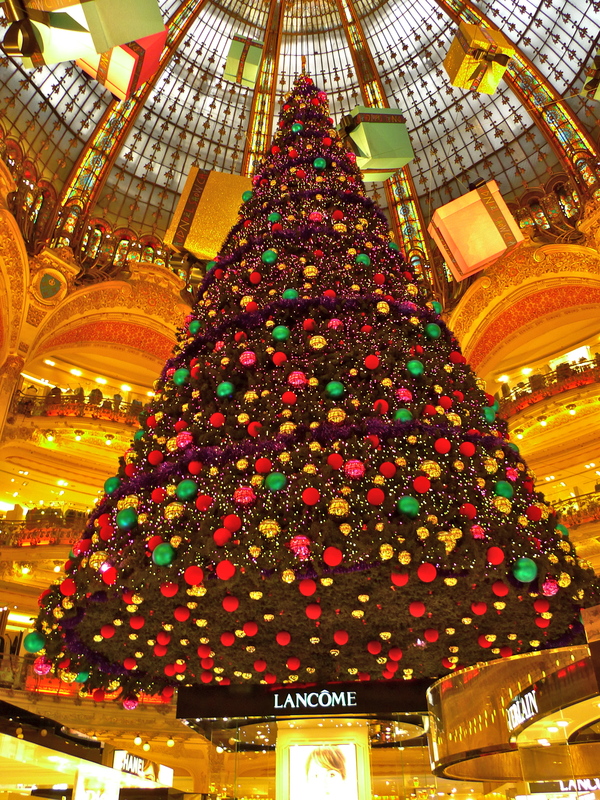 The Galeries Lafayette is famed for its stylish window displays – no more so than at Christmas when crowds of people gather to see the show. Today, the Galeries Lafayette is a magnet for tourists with the Chinese leading the way followed by Americans and then Japanese. A walk through the store reveals a cosmopolitan mix of people some of whom come just to look and others who come to spend, spend, spend! 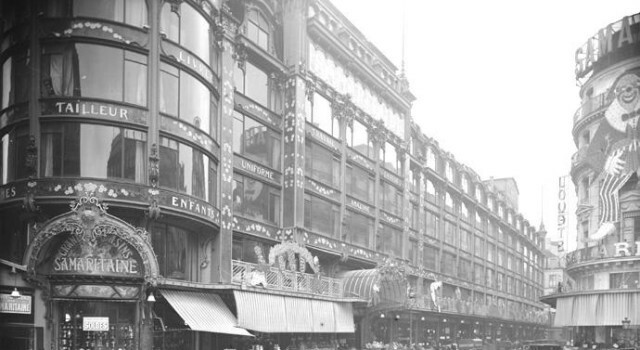 It may have begun life as a modest corner shop, but the Galeries Lafayette, along with the other new-fangled 19th century department stores, Printemps, Bon Marché and La Samaritaine, started a revolution in retail shopping which continues today. 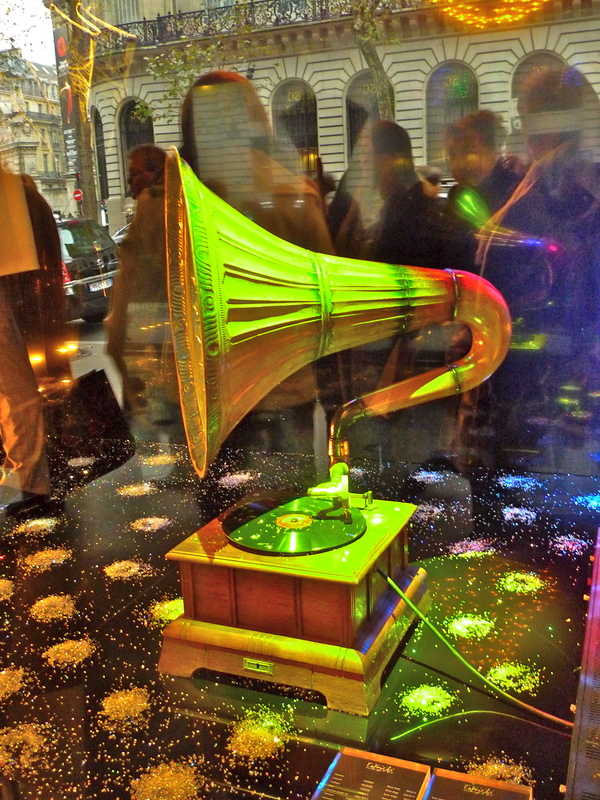 The sound of a walk outside past the window displays.